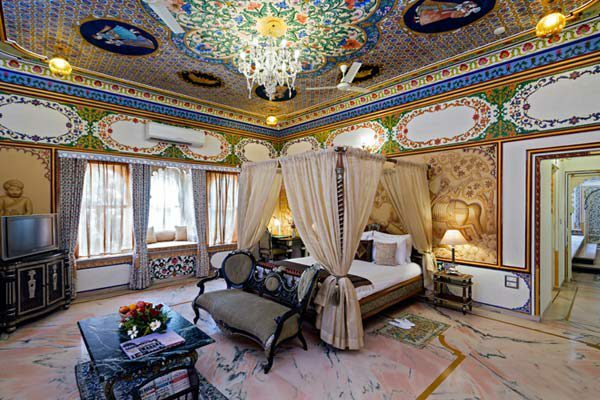 Chunda Palace in Udaipur is not as vastly popular property as much it is ought to be but perhaps that is the reason why it is a little extra special than the others. Having said that a little bit of google and you would have a vague idea about this luxurious boutique hotel for your destination wedding in Udaipur. 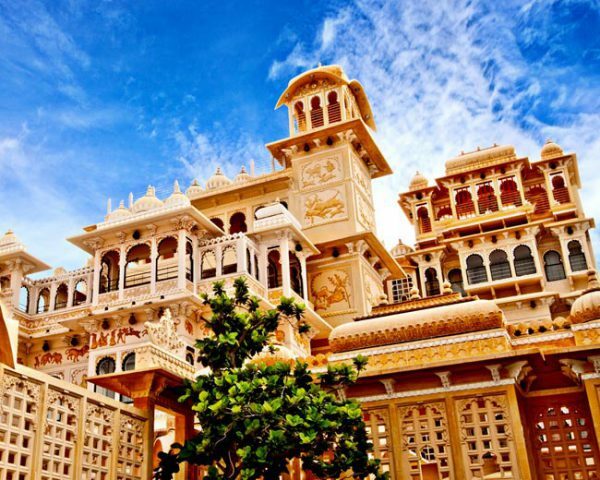 As destination wedding planner we feel it is an incredible venue with heaps of traditional Rajasthani character that adds a royal tinge to your wedding, a quintessential element for your destination wedding in Udaipur. 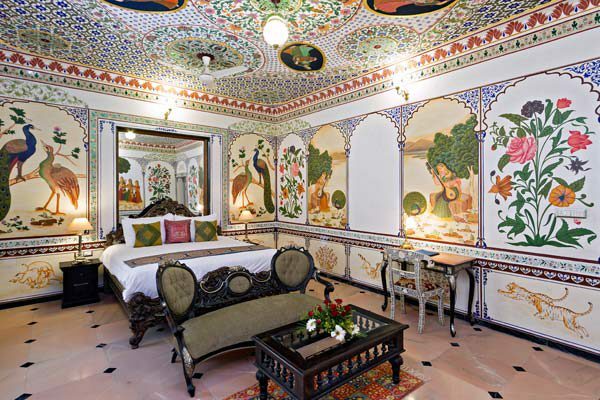 The intricately painted walls and ceilings are a work of art reflecting the rich heritage of Mewar region and is one of the most remarkable feature of Chunda Palace. Be it the couryards, corridors, walls of your room or ceilings, it is painted with stories. You cannot help be feel awestruck by it. 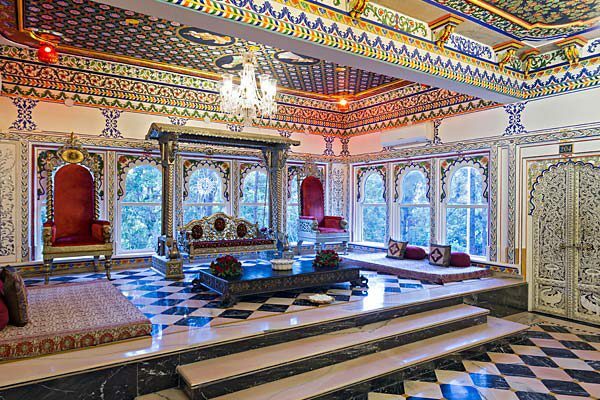 If charming is what you are looking you might want to consider Chunda Palace for your regal wedding in Udaipur. You may also want to visit the Lonely Planet to know more about this heritage property. The boutique hotel has a total of 46 rooms with 30 palace rooms (base category) and 16 suites. The palace rooms can easily accommodate up to three guests while a suite can have four guests comfortably staying in it. 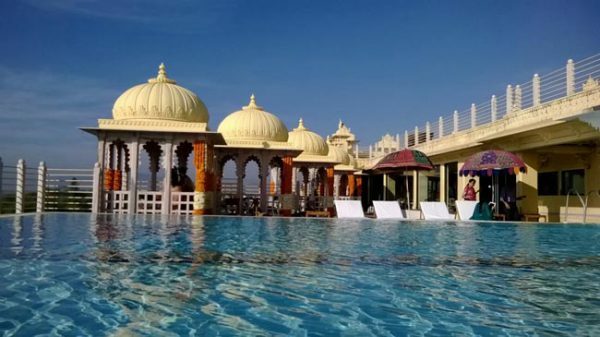 So if your guest list is somewhere between 155- 160, Chunda Palace could very well be considered or if you have a bigger guest list you could consider bifurcating your guest list to nearby hotel Radison Udaipur. 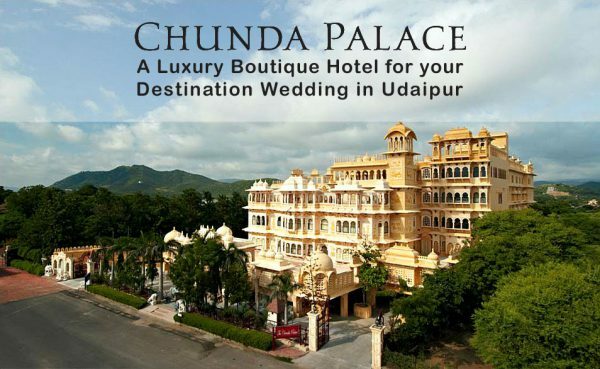 Another reason that we like Chunda Palace for your royal wedding at Udaipur so much is that it offers a range of venues to host your many functions. We absolutely love the terrace which offers stunning views of Lake Pichola and Aravalli hills for the main ceremony and can easily accommodate 300-350 guests. Mehendi and Sangeet could be arranged at their first floor terrace which is a combination of indoor pool, billiard room and Pratap chowk (courtyard) can hold up to 225 guest. While Lunch and Cocktail could be organized at the pool terrace. And in case you are doing a residential wedding i.e. taking the entire hotel there wouldn’t be any additional venue charge. 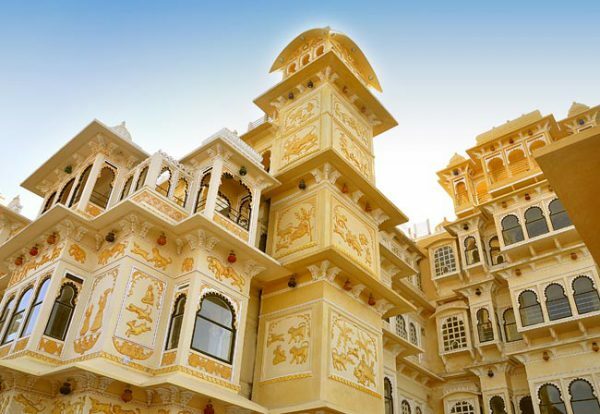 If there were such a thing as budget luxury, it would be an apt description for Chunda Palace. To give you an approximate idea, palace rooms may cost somewhere between INR 12000 to 18000 depending on the season and availability. While the suite would be somewhere around 20,000 onwards. (Rates are always subject to revision as per the hotel policy and regulations). For Meals and Gala Dinners, which costs you as much as the stay does or sometimes exceeds even the accommodation cost too, is a significant factor to be considered while working the costing. You may choose a meal plan most relevant to you, and it may range from INR 1200 to 2300 exclusive of taxes. For a more detailed insight we strongly recommend you read our article Cost of Planning a Wedding in Udaipur. On a Mehendi evening maybe you would like to arrange for serenading music or dance performance by the folk artists. Please note the music can only be played until 2200 hours but the party can always be moved to one of the indoor banquets. The property is so gorgeous itself there isn’t much you would want to do in terms of decor, minimalistic styling that accentuates and highlights the requisite elements, because otherwise it would be like interfering with something that is already so beautiful. 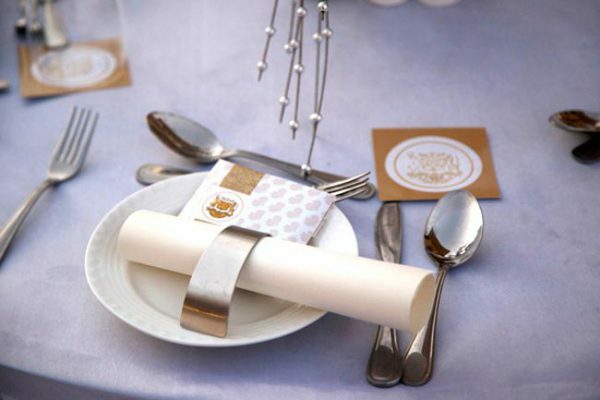 And of course we reckon you would like to litter the wedding decor with tons of meaningful details that makes it rather special and memorable for you and your guests. 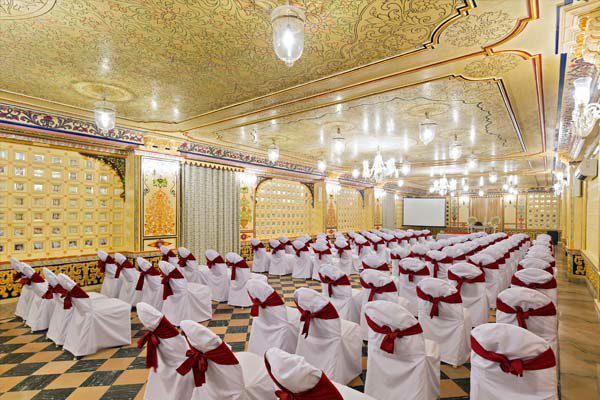 There are so many reasons of planning a wedding here at Chunda Palace but one that pops up is its Islamic domes and mesmerising paintings and glass work that makes you feel like as if you are having your wedding in some art museum or perhaps you have stepped back into time, this is precisely what makes it a priceless experience. If you feel like this is the kind of experience you and your special one would like to have for your wedding, we would be happy to be get on board and help you create your dream wedding. All you have to do is fill this rather basic form and we will get in touch with you.